Candidates from the ruling Progressive Party of Maldives (PPM) have won six out of nine council by-elections scheduled for August 1 after no other candidates stood for the vacant island and atoll council seats. The six seats include the Meemu Dhiggaru constituency atoll council seat, and one seat from the Kaafu Maafushi, Vaavu Felidhoo, Haa Alif Muraidhoo, Thaa Madifushi, and Shaviyani Kanditheemu island councils. By-elections will take place for vacant seats on the Haa Alif Dhidhoo, Haa Dhaal Naivaidhoo, and Noonu Hebadhoo island councils on August 1 between independent candidates and ruling party candidates. The by-elections were triggered by the resignation of several island and atoll councillors. In April, the ruling party was accused of vote buying after handing over air-conditioners to a school in Raa Atoll Alifushi, shortly before an island council by-election. The opposition had also accused the PPM of vote-buying and bribery in the Dhiggaru constituency parliamentary by-election earlier this month after the donation of x-ray machines and air conditioning units to the constituency. President Abdulla Yameen had also pledged to provide a 140 kilo-watt power generator for Dhiggaru and urged constituents to vote for Faris to ensure development. President Abdulla Yameen visited Meemu Dhiggaru today to campaign for the ruling party candidate ahead of the upcoming by-election for the constituency’s vacant parliament seat. “There will be a 145 kilowatt generator in Dhiggaru before the start of Ramadan,” he said at a campaign event, according to president’s office spokesperson Ibrahim Muaz Ali. The president’s nephew, Ahmed Faris Maumoon, is contesting the June 6 by-election as the Progressive Party of Maldives’ (PPM) candidate. Faris is the eldest son of PPM leader, former President Maumoon Abdul Gayoom. President Yameen’s pledges follow PPM MPs assuring development of the five islands in the Dhiggaru constituency if Faris wins the by-election, prompting allegations of undue influence and bribery. In his remarks at Dhiggaru, President Yameen also slammed the opposition’s continuing protests, saying demonstrations would not lead to development. Tourism minister Ahmed Adeeb, housing minister Dr Muiz, and more than 25 PPM MPs accompanied the president during the trip. The delegation also visited Madduvari and Muli in Meemu atoll. “Addressing the people of the islands, the president mainly ‎highlighted the developmental projects to be carried out in the islands,” the president’s office said. The PPM has previously been accused of bribery over the delivery of an x-ray machine to Muli last week. The government has also signed an agreement with state-owned Maldives Transport and Construction Company to build a harbour in Dhiggaru. 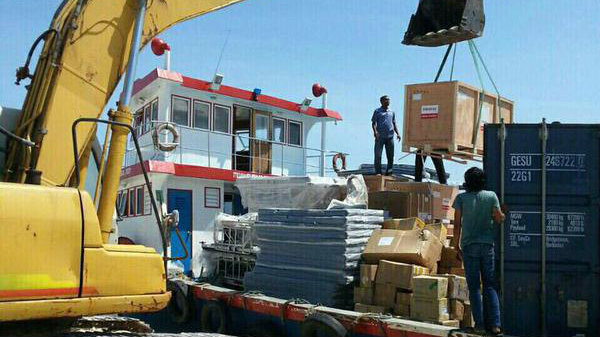 The ruling party was previously also accused of vote-buying after openly handing over air-conditioners to a school in Raa Atoll Alifushi, shortly before an island council by-election. The Progressive Party of Maldives opened a campaign haruge (meeting hall) in Malé last night ahead of the June 6 by-election for the vacant Dhiggaru constituency parliament seat. Former President Maumoon Abdul Gayoom’s son, Faris Maumoon, is contesting the by-election as the ruling party candidate. Speaking at last night’s rally, Gayoom reportedly said that increasing the number of PPM MPs is important for the government to fulfil its pledges and implements its policies. Gayoom – also PPM leader – noted that the PPM has won the presidential and parliamentary elections as well as 90 percent of council by-elections due to its strong support among the public, but urged the party’s supporters and campaign workers not to take victory for granted. In his remarks, Faris praised President Abdulla Yameen’s efforts to develop the Dhiggaru constituency as well as the rest of the country and thanked supporters working in his campaign. The ruling Progressive Party of Maldives (PPM) has won a by-election held yesterday for a vacant seat on the Gaaf Dhaal Vaadhoo island council. PPM candidate Naushad Waheed won the by-election with 329 votes against independent candidate Abdulla Rasheed, who got 309 votes. A second by-election was also held on Saturday for a vacant seat on the Raa Angolhitheemu island council with three independent candidates contesting. The winning candidate, Mohamed Ibrahim, received 101 votes, while the second placed candidate, Aishath Inasha, received 92 votes. Both by-elections were called when independent councillors resigned from the five-member Vaadhoo and Angolhitheemu island councils. The Vaadhoo council currently has four independent councillors and one PPM councillor, while the Angolhitheemu council has four opposition Maldivian Democratic Party councillors and one independent councillor. The ruling Progressive Party of Maldives (PPM) has been accused of bribery for delivering an x-ray machine to the island of Muli in Meemu Atoll two weeks ahead of a parliamentary by-election. PPM parliamentary group leader Ahmed Nihan said the government had delivered an x-ray machine to Muli, in the Dhiggaru constituency, and urged islanders to vote for PPM candidate Faris Maumoon. “The government fulfills its pledges, vote for our candidate Faris Maumoon,” he said in a tweet yesterday. Others questioned if the state had also paid for a radiologist at the island hospital. @ibujalyl and who bears the running cost and the salary for radiologist? State? If so x-ray machine is an unplanned burden on taxpayers. One highlighted the distribution of air conditioners in Raa Atoll Alifushi before an island council by-election in April, and said the donation of x-ray machines to Muli were similar. @Maashie @ahmed_nihan @afarismaumoon thi X-Ray machine ekey Gree Ac thakaa netheh nun thafaatheh. E ehchis vs dhiny hama migothah. “Islanders only needs x-ray machine when the Malé man needs a vote,” another said, referring to the lingering discrimination between islanders and residents of Malé. @MickailNaseem , XRay machine hirafus aran hunnaanee . Dhen anna Election ah technician . Evaru ok vaane .one at a time . “The x-ray machine will only gather dust. A technical will only be set for the next election. That is OK, one at a time,” June Rasheed said. “This is a government which makes promises and fulfills them. 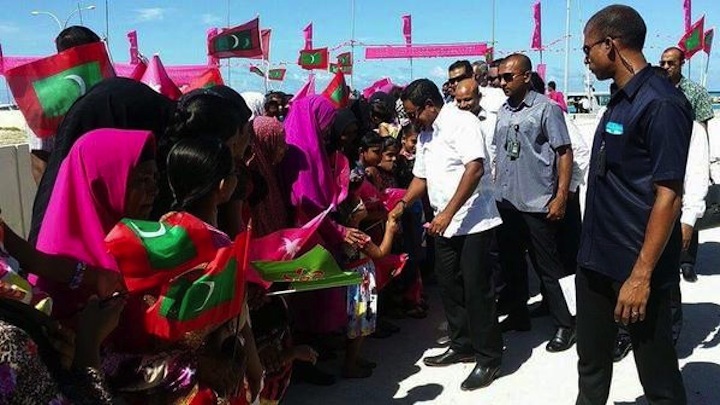 That is why the people should vote for Faris Maumoon in the upcoming election,” said Nihan. The government has also signed an agreement with state-owned Maldives Transport and Construction Company to build to harbors in the Dhiggaru constituency. “All of these projects were included in the budget, after the former MP asked for the development projects for his constituency,” he said. The by-election, scheduled for June 6, was triggered by the conviction of former PPM MP Ahmed Nazim on corruption charges. The Supreme Court had stripped Nazim of his seat after sentencing him to 25 years in prison on April 6 for defrauding the state of MVR1.4 million (US$91,400). Former President Maumoon Abdull Gayyoom’s son Faris secured the ruling party ticket after winning a primary with 67 percent of the vote against Meemu atoll council president. Another PPM atoll councillor, Moosa Naseer Ahmed, is also contesting the by-election as an independent candidate. The third candidate is the main opposition Maldivian Democratic Party’s Ahmed Raazee. The ruling part was previously also accused of vote-buying after a high-profile handout of air-conditioners to a school in Raa Atoll Alifushi, shortly before a council by-election. The Elections Commission has brought forward the by-election for the vacant parliament seat for the Dhiggaru constituency to June 6. The commission previously scheduled the election for June 13 after ruling party MP Ahmed Nazim was found guilty of defrauding the state of MVR1.4 million (US$91,400). The Supreme Court sentenced Nazim to 25 years in prison on April 6, overturning lower court rulings that dismissed the corruption charges against the former deputy speaker of parliament. The ruling Progressive Party of the Maldives (PPM) has invited interested candidates to seek the party’s ticket while the opposition alliance has said it will field a single candidate. The opposition Maldivians Against Brutality coalition, made up of Adhaalath Party, Maldivian Democratic Party, and members of the Jumhooree Party, said they are holding discussions on fielding a single candidate against the PPM. Adhaalath spokesperson Ali Zahir and a PPM member on the Meemu atoll council, Moosa Naseer, have expressed interest in standing for the vacant seat. The ruling Progressive Party of Maldives (PPM) has won two seats in the Shaviyani Atoll Milandhoo Island Council by-elections. PPM candidates Mohamed Mansoor and Hassan Abduhrahman won the two seats against the opposition Maldivian Democratic Party (MDP) and Jumhoory Party (JP) candidates. “Winning the Milandhoo elections in this crucial time is an incredible win for the party,” PPM MP Abduraheem Abdulla told Haveeru. Mohamed Mansoor got 596 votes while Hassan Abduhrahmaan got 558. The JP candidate Mohamed Rasheed got 464 votes while MDP candidate Ahmed Azeem got 459 votes. President Abdulla Yameen announced last night that a land reclamation project would commence next year in the Feydhoo ward of Addu City. Speaking at a ceremony held in Feydhoo to inaugurate a road construction project, President Yameen said construction of the Rahdhebai Magu “will greatly assist the island’s residents, while paving the way for further development projects in Feydhoo,” according to the President’s Office. President Yameen was accompanied by First Lady Fathmath Ibrahim and Tourism Minister Ahmed Adeeb during his visit to the southernmost atoll. A by-election for a vacant seat in the six-member Addu City Council is meanwhile scheduled to take place on September 20. The election comes after Addu City councillor for the Feydhoo constituency, Abdulla Aswan, died of a heart attack on July 8. 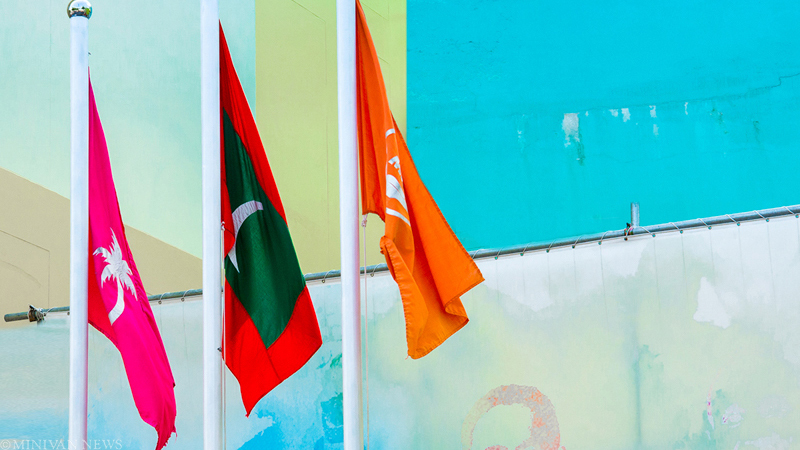 All six seats of the city council were won by opposition Maldivian Democratic Party candidates in January’s local council elections. Speaking at a meeting in Feydhoo last night, President Yameen reportedly criticised the city council over a stalled project to install lights at the Feydhoo football stadium. The project remained stalled due to a disagreement between councillors, Yameen claimed, calling on the council to cooperate with the government’s development efforts despite political differences. “If something else is beneficial [to the public], they don’t have to consider the ideology of a political party. They should do it the way the public wants,” he was quoted as saying by newspaper Haveeru. Yameen urged the people of Feydhoo to vote for ruling Progressive Party of Maldives (PPM) candidate for the Feydhoo council seat, Ena Naseer. The Feydhoo branch of PPM handed over membership forms of 100 new members to First Lady Fathmath Ibrahim at last night’s meeting. The opposition MDP meanwhile selected Ali Fahmy Ahmed as its candidate to face the by-election in a primary last month. Speaking at a press conference today, MDP MP for Addu Meedhoo, Rozaina Adam, accused President Yameen of attempting to unduly influence the upcoming by-election by launching or announcing development projects in Feydhoo. Referring to pro-government MPs rejecting an urgent motion in parliament over power outages in Addu City, Rozaina questioned the president’s sincerity and commitment to develop the city.